Today my gift to you is something we all possess: our Universe. The image above shows the whole sky in many different kinds of light. Visible light is what we can see with our eyes; the view is dominated by the disk of the Milky Way, our galactic home. However, visible light is only a narrow portion of the total spectrum. The two pictures immediately below are different wavelengths of infrared (IR) light that emphasize many different sources, including emission from dust. The gamma ray and X-ray images pick out neutron stars, black holes, supernova remnants, and other bright energetic phenomena. Hydrogen is the most common element in the Universe, and it emits light in the radio portion of the spectrum. 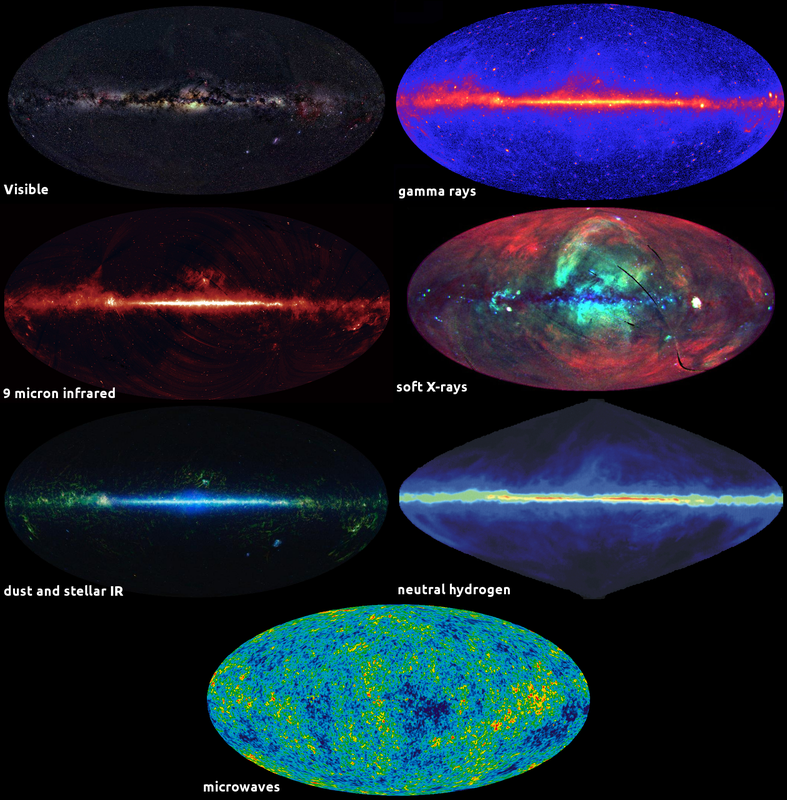 However, as a cosmologist, I most love the final image: the sky in microwave light. While the visible, infrared, radio, gamma-ray, and X-ray emissions show us a Universe as it is today—stars, dust, gas, and galaxies—the microwave sky reveals our origins. The colors in that image represent tiny fluctuations from when the Universe was less than 400,000 years old. Those fluctuations over time grew to become galaxies. Our beginnings are marked out in these colors. The Universe’s past and present are revealed in these images.